Four chairs. Four adorable bears. All is well until Big Brown Bear shows up — what a stare! — and wants a seat. Can these clever bears put their heads together (among other things) and make space for one more? With endearing, expressive illustrations and a sustained rhyme in every line, here is a cozy tale that makes it clear there is room for all. Shirley Parenteau has written a number of books for children, including ONE FROG SANG. She lives in Elk Grove, California. David Walker has illustrated several children’s books, including DOMINO by Claire Masurel and FLIP, FLAP, FLY! by Phyllis Root. He lives in Chapel Hill, North Carolina. Between the unerringly positive approach to a common early-childhood dilemma and the can't-miss rhyme, this volume will likely find its place on many a daycare shelf. Parenteau’s brief rhythmic text is bouncy and light, and ideal for reading aloud. 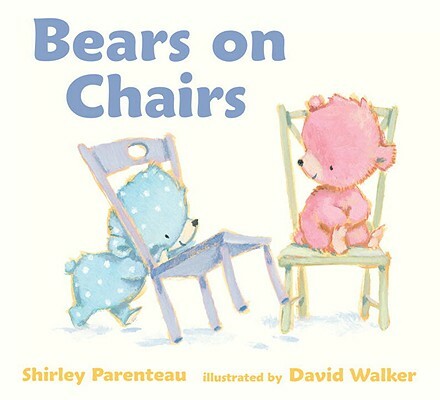 Themes of sharing and compassion are introduced in developmentally appropriate, subtle ways, and the bears’ discovery of their own resolution is a refreshing conclusion to the story. Walker’s acrylic illustrations match the airy lyricism and mood of the text. Along with the visual treat of watching softly colored bears and chairs on expanses of white pages, this book cleverly melds words and art.